Welcome to ReachMD. I’m your host, Dr. Jennifer Caudle, and joining me today is Dr. Sarah Domoff, clinical faculty member and Director of the Family Health Lab in the Department of Psychology at Central Michigan University. She is actively involved in training clinicians on the impacts of prolonged screen time and media usage on children’s health. Dr. Domoff, welcome to the program. So let’s begin. When do you feel screen addiction in children began to become known, and how has it progressed over the last few years? There are a lot of misconceptions when using the term addiction to apply to obsessive screen media use, and so I do want to start off with some points for clarification. So some of the parents and patients that we treat, they use the term colloquially or to express their concerns about too much screen use and the associated effects of use, but scientifically, the concept of addiction applied to screen media use in children has not been studied as extensively. In reviewing the literature, it seems that most of the research has been on adults and older adolescents on one particular type of screen media use, which is video game addiction or internet gaming disorder, so there’s enough compelling evidence on that area of research and screen media use to warrant its inclusion in the DSM-5 in section III; however, this is not yet diagnosable, and we have yet to uncover pathways to gaming addiction in children under age 14 years, and that’s where my research comes in. So my measure, the Problematic Media Use Measure, is one of the first to use the DSM-5 symptoms to assess—and I put this in quotes—“addictive-like use of screens in children under age 14.” So this screener lists all media so that pediatricians and psychologists and other healthcare providers can screen for excessive use. I have an active research program exploring how and when excessive screen media use emerges, and I also have the clinic specializing in differential diagnosis of screen media addiction and treatment. So taken together, we are just starting to really examine this topic more comprehensively in a more in-depth manner, so a lot of what I’ll be saying is research on smaller studies and some hypotheses that we’re currently testing. When we think about screen or technology addictions, are all types created equally, or are there differences in how addictions manifest between television, mobile devices, social media platforms and even game consoles? How does screen addiction compare with drug, alcohol or gambling addictions? Are there neural or behavioral similarities between the three of those? So specific, again, to gaming addiction, we do see similar patterns in neural responses comparable between that and drug addiction, and again, behavioral similarities, and this is kind of where I think kind of the key take-home message is for a physician working for families. It’s not so much the amount of time the child or adolescent is using their screens or gaming. It has to cause dysfunction or really interfere with their functioning in some way, so there is the other kind of parallel here. So, again, naturally you’d imagine that higher amounts of screen media use would correspond to more endorsement of symptoms of addiction, but really, I think the key point is: Is this interfering with the child’s life? 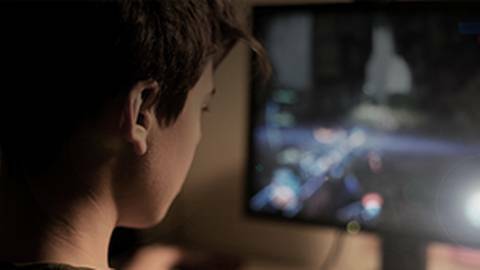 Are parents saying, “My child isn’t sleeping in order to game,” or, “My child is not showering,” or not taking care of him or herself because they feel really compelled to continue gaming or other types of screen media use? And what are some of the warning signs that clinicians and parents should watch out for, and do these change based on age differences in children? So, again, with gaming addiction, we’re seeing patterns of neural responses that are pretty comparable to that with drug addiction, and in terms of behavioral similarities, we are seeing that as well. And, again, I think the kind of key point here is that this use has to cause dysfunction in the child or adolescent’s life to make it problematic or addictive, so very comparable to that of alcohol or other types of substance addictions. It can’t just be: How much are they using it? It has to be: Is it getting in the way of the child’s life? Is it interfering with an adolescent’s functioning? Are they having trouble sleeping because they really want to continue gaming? Are they withdrawing from social interactions to continue gaming or using other types of screen media? So that dysfunction really has to be there. And I think for physicians working with families, a lot of times they want to know how many hours indicates that there’s a problem, and I would reword their question to be, “Well, what are you seeing in their screen media use that makes you think that there could be a problem? Are you having trouble setting limits, or are you having trouble getting them away from screens?” And I’m happy to talk about some of these symptoms or signs that clinicians can look for to really indicate that there is a problem and that they suggest that it may be more of an addiction. That’s very helpful. So let’s turn to clinical management now for a moment. Let’s talk about approaches or tools that you might recommend to parents or to physicians to identify and curb screen addiction. Yes, so the Problematic Media Use Measure that I developed, it was just published last year, and I’m, of course, happy to share with any physician who might be interested in using it. It uses, again, those 9 symptoms from the DSM-5. And so, basically, these symptoms consist of how a parent perceives their child interacts with their screens. And so I’ll tell you about what I would recommend doing for younger children versus adolescents. So, when we have parent report, what we’re asking is: Does the parent feel like the child is trying to hide how much they use screens? Are they sneaking screen media or games, for example? Does it seem to be that all the child seems to think about is their gaming or whatever screen media they are particularly interested in? Does it seem like the child is using screen media such as games or social media to handle negative affect or to increase their mood or to avoid stressors in their life? Does the amount of time the child using screen media keep increasing? From what we heard from families that are struggling with this is that it’s really hard to pull their child away from the screen. So, specifically, they may have temper tantrums or really show explosive reactions to trying to take away screen media from a child, so those are the types of signs that indicate, okay, this could be a problem. And note how different that is from just asking, “How many hours does your child use the screen?”—because we really want to make this distinction between a problem with it versus a child being really passionate or really enjoying gaming or using screens to be creative or to develop things. It’s a nuanced way to look at it, but it’s really important to make that distinction. Our measure is really a parent report form, so that’s really for kids that are pre-teens and younger, but with adolescents, these are the types of questions you can ask them. We have addictive-like use of phones scale, and there are media-specific disorder use of screen media tests or questionnaires that have been validated in adolescents, and so with the older kids, we definitely talk to them about these symptoms. We get their perspective on it. We try to understand are they endorsing these symptoms, or do they think that “this is something that I enjoy, but it’s not interfering with my life,” so we definitely want both parent and adolescent feedback on that. There are adolescent self-reports that we would also want to administer for those older children we work with. And the other thing is, with screen-based technologies becoming more and more a part of our everyday lives, where do you think we’ll be with this issue in 5 or 10 years? Absolutely, so I’m really passionate about helping clinicians, physicians, develop a toolkit that they could use in working with children and families around these topics. I think it’s going to continue to be a growing issue, and it would not surprise me if we start seeing more of an influx of families coming in wanting to talk to physicians about this, so being well-prepared is a great idea. And my clinic specifically treats screen-addicted youth and youth with other types of problematic media use. I recommend using one of these screeners to see are parents or adolescents endorsing that this may be a problem. You can ask about the number of hours, but really, to make that distinction, you really want to know how much this is interfering with their life. So specific to treating what may be called like screen addiction or accessive use, I recommend the younger children really working closely with the parents. Increasing parenting skills and efficacy around limiting screen time will be really important, because in my clinical work, what’s really challenging is just automatically taking away all screens. We have heard about instances where children may become really aggressive or have meltdowns, and it’s really hard for parents to do that and stick with that high level of limiting, so what I recommend is slowly decreasing the screen media use. Now this is, I’d say, for children pre-teens and younger, so working on decreasing the amount of screen media use each day and replacing the time that they spent gaming or doing other types of screen media with activities or tasks that would improve any deficits that may have resulted from the excessive screen media use or worsen their baseline mental health symptoms. So, for example, with some of the children that I’ve worked with, we hear that some social skills deficit sometimes emerge or kind of coincide with excessive gaming, so what we want to do is take away from those hours of gaming and have them be engaged in some sort of extracurricular activity or team or sport where they can get and build those social skills, so it’s really important to replace the hours with something positive and beneficial for the child. You can imagine this takes a lot of work and it’s a process because there are multiple steps here that the families will have to take, and a lot of the early work is helping parents with some of their patterns of thinking about screen time, because for some youth, gaming excessively is the only time that the parents see their kids happy is when they’re behind a screen or gaming, and so it’s also really challenging to have to take away something that the child feels so reinforced by and trying to find something else that will be rewarding to that child, so it’s both like a family component and like a parent management training approach. And, Dr. Domoff, this is a really interesting topic, and you’ve talked about a number of really interesting and very helpful aspects of this. Is there anything else you would like to add? So I definitely think that as virtual reality or VR becomes more common and in more households, I think we’ll be dealing with some of that specifically, families asking us for help with how young is too young for the child to be immersed in a virtual reality. I’m concerned, and something that may be occurring right now for some physicians is helping parents with their own screen addiction. Sometimes I hear from adolescents that it’s really hard to change their habits or their social media use or their phone use when in their household everyone in the home is behind a screen, and so as we move forward where there’s more adoption and people becoming more tethered to their phones, I think part of the work will be working and screening for parents for excessive use of screens and helping them reduce that so that they can be models for their children and have a healthy balance of screens in their lives. And so one of the really challenging things about this research and the practice is that really over the next couple years is when we’re finally going to be able to see what happens to children who are chronically and intensely exposed to—have screen exposure, so it’s a concerning issue because we don’t know yet, but we hopefully within the next few years will be able to see if there are brain differences, when it’s too early to start, if there is like moderation of effects by type of content. And I think what’s important about this topic and kind of uplifting and hopeful is that parents are concerned about their children’s media use, their screen time. A recent study found that I think close to 50% of parents are concerned about their child being addicted to mobile devices, so I do think what’s a positive thing is that parents want advice, they want answers, they need guidance, and so if they’re coming in to talk about concerns about addiction to screens, I think physicians and other healthcare providers could use this as a window of opportunity to communicate recommendations to parents about other types or other concerns, really, to screen time, and that specifically being the content, what the child is seeing, as well as when the child uses a screen media. So I always, if they come in with questions about addiction, try to also, if you can, talk about, “When does your child have to have his or her phone with him or her? Do you have screen-free zones in the home?” So I think there’s enough interest and concern that we can build on that and provide real important information to parents about other aspects of media use that we know can be beneficial or detrimental to children’s health and well-being. And then finally, what I would hope—I’m going to end on a positive note—is that within 5 to 10 years, there will be more financial or funding support from the government for research on this topic and policies on restrictions for children, support from philanthropists to fund scientists like myself, because we need research for public health and for the well-being of our society. We need more research on this. And as you know, the technology moves so quickly and changes happen so rapidly that it’s really important that we have an infrastructure in our society that will help fund this research and help develop clinics so that families don’t have to travel so far to get the help they need when it becomes disordered use. And with that, I would like to thank my guest, Dr. Sarah Domoff, for sharing her insights on screen addiction in children. Dr. Domoff, it was great having you on the program. I am your host, Dr. Jennifer Caudle, and to access this episode and others in the series, please visit us at ReachMD.com where you can Be Part of the Knowledge. Thank you for listening. Are your pediatric patients addicted to their screens? Know the symptoms to look out for. To address the growing issue of prolonged screen time and media use among children, Dr. Jennifer Caudle speaks with Dr. Sarah Domoff, Director of the Family Health Lab at Central Michigan University, about the tools available to help physicians identify and curb screen addiction.